Buy through MusicWeb from £18/19/20.25postage paid. Andromeda compilations spell extra and frustrating work for the critic. I’ve recently delved into the Furtwängler-Bruckner discography when reviewing that recent set. There I vented spleen on the basking shark approach to their releases (see review) and my exasperation was not confined to merely unpicking the seams of their choices but worrying away at inappropriate fillers and the like. 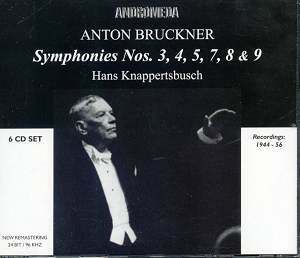 And now here is Knappertsbusch’s Bruckner with rather more clearly focused bonus tracks – Liszt and commendable Wagner. But the problems remain of course, and uppermost amongst them is the question of the discography. Let’s be clearer then, though I should add that the following doesn’t pretend to be an exhaustive comment on available transfers and alternative performances. The 1954 Munich No.3 is presumably derived from Music and Arts’ CD 257. Other performances include the same year’s commercial Decca with the Vienna Philharmonic and there’s an NDR from 1962, once on Discocorp. The Munich performance is rough hewn and rustic. Ensemble precision, as you would expect, is not of the highest and Kna’s rallentandi sometimes catch out the orchestra. No.4 is the Berlin Philharmonic performance given in Baden-Baden during wartime. You might recall this from another Music and Arts transfer, this time CD249 and Iron Needle. Two VPO performances have survived – the commercial Decca (1955) and the early sixties performances on Nuova Era. The 1944 performance – the well-worn Schalk-Löwe 1886-87 revision is the edition he habitually used – is again a roughly played and only approximate performance. The horns begin very shakily and though they recover can’t be relied upon. To compensate however for technical frailties we have a powerful Andante, consoling and tragic, and a meatily demotic scherzo. The finale is trenchant, dramatic and overwhelmingly exciting. In fact it’s one of the most combustible Fourths on record. No.5 is the Decca commercial recording of June 1956. A Munich performance with the city’s Philharmonic and which dates from 1959 was on Movimento Musica – yet another interchangeable Italian privateer. Kna plays the Schalk truncation which, as with the Fourth, brings forth all sorts of textual skeletons. Nevertheless Kna stuck to his guns with regard to editions and in fairness to him in certain cases there wasn’t then much viable alternative. The playing is rapt without becoming devotional, even in the slow movement, which is kept moving forward. It’s played with a true symphonic arch notwithstanding jibes as to his control, and even when the structure comes close to being imperilled by Schalk’s wholesale revisions Kna emerges triumphant; Bruckner too. Seven Seas have actually also issued this 1951 Berlin No.8 on KICC2027 and Hunt likewise on CD711. Music and Arts issued the Bavarian State 1955 performance, Memories dug out the VPO, and MCA offered the commercial 1963 Munich recording. It’s as well that we hear the Berlin performance and not the Munich because the former is an infinitely better performed piece of work and not subject to nearly so many orchestral mishaps. Of course textual matters will be of concern to listeners but seen in the light of his Bruckner performances generally they are surely subordinate to the sense of massive characterisation and eloquence that the conductor generates. Even if I think this a lesser performances than say the Seventh and the Fifth, it still stands as a kind of monument of Knappertsbusch’s Bruckner conducting. As for the Ninth we revert to Music and Arts CD219 for the origin of this one, though Foyer has also issued it [CDS16004]. The only other Ninth known to me to be around is the February 1958 Bavarian State on Hunt CD710 – this company had a run of Symphonies Nos.7-9. The Ninth is heard in the Löwe revision. As with the Fifth Kna employs a full panoply of expressive devices, huge dynamics and powerful contrasts, to make his points. As before and in contradistinction to the views of many of his detractors, he does not do so through the expedient of slow tempi. The attractiveness or otherwise of this set is entirely dependent on how much you have elsewhere. Nothing here is new to the discography. The performances are in the main of outstanding power and eloquence.